Have your kids ever drawn on your walls? Do they hate sitting down to practice writing? 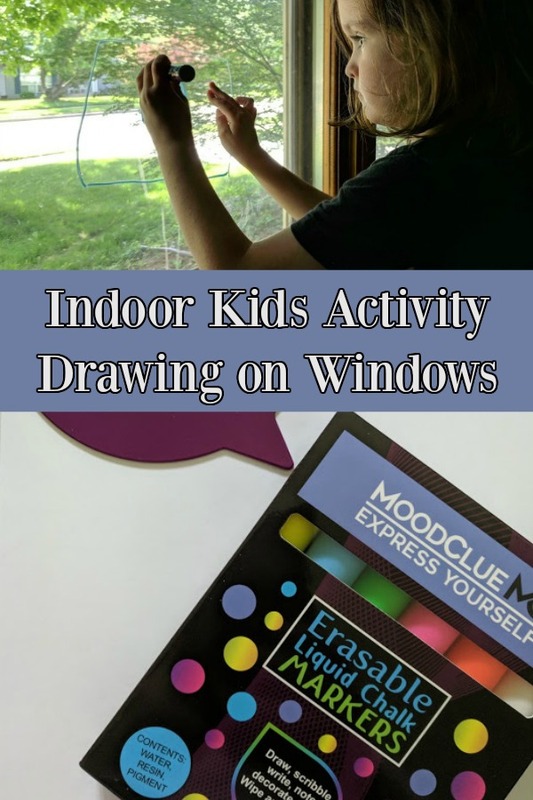 Then I have a fun indoor activity your kids will love… letting them draw on the windows! I know, I know. But hear me out! My kids have marked up my walls and drawn on things they weren't supposed to over the years, but trust me THIS activity is fun and easy to clean up. This post contains affiliate links and we'll earn a small commission if you make a purchase. We received MoodClue liquid chalk marker sets to review and donate to my daughter's classmates. No matter how many wonderful activities I may suggest to my kids, it can be tough to keep them occupied and entertained when they are stuck inside all day. Since I work from home, it's important for me to find ways to keep them busy while also sticking to our screen time rules and routine. 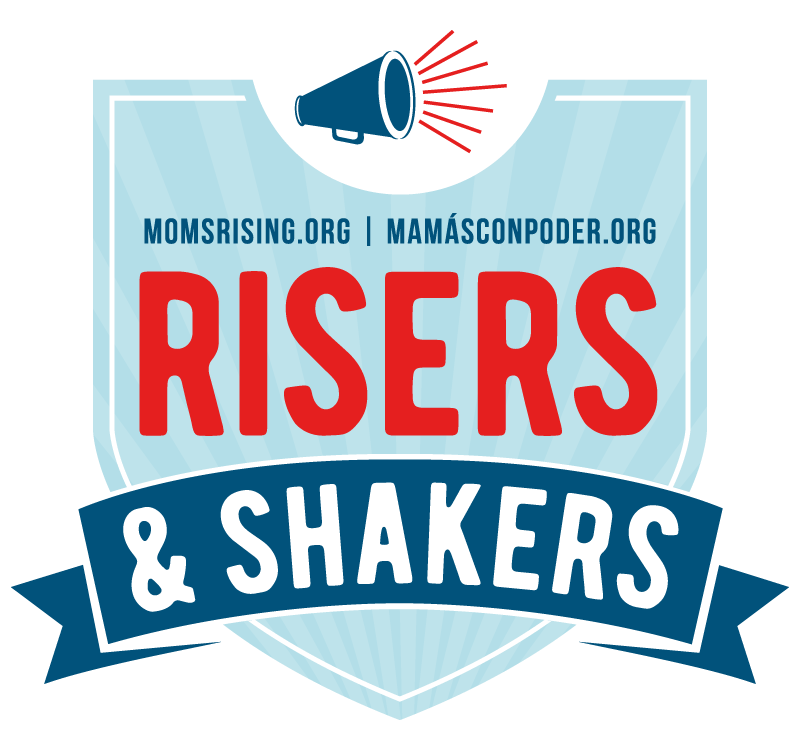 So, it's time to shake things up a bit. 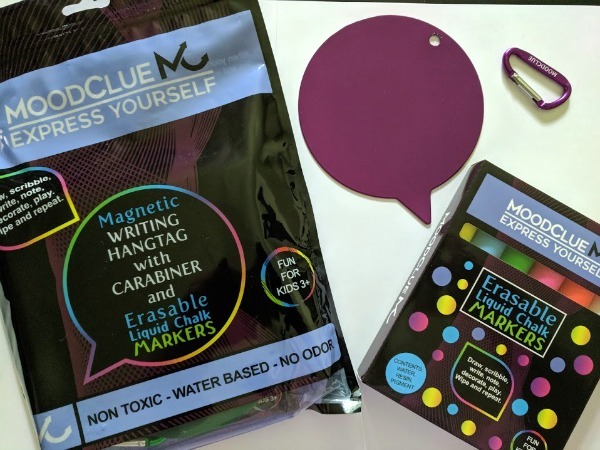 When we first opened our package from MoodClue, we used their liquid chalk markers to decorate the metal speech bubble backpack accessory. The kids loved writing their names and drawing smiley faces, wiping it off, and doing it again. But then I said something unexpected. My kids stared at me like I was an alien with two heads, but only for about two seconds before scrambling over to the window. They were not going to waste too much time questioning me in case I changed my mind. MoodClue's liquid chalk markers work great on non-porous surfaces like glass and metal. They can also be used on some whiteboards and chalkboards. They are fun to use when painting rocks or drawing on our concrete steps (since they draw so much smoother than regular chalk). The kids were thrilled to write and draw on our windows with liquid chalk markers. My daughter said it was fun because it felt naughty, like I was letting do something they would normally get in trouble for doing. They drew on every window they could reach! While they were drawing, I also turned it into writing practice without them realizing it. I suggested they write their names and a few other words. It didn't take long before they were asking for help to spell out short phrases. I will definitely be using the windows for more reading and writing practice in the future! During the last week of school, we took the additional MoodClue sets we received and handed them out to my daughter's classmates. A couple other moms have thanked me for the chalk markers and shared how drawing on the windows kept their kids busy. Cleaning off liquid chalk marker is pretty easy. You can use a wet or dry paper towel or washcloth and wipe it away. I have the kids use dry towels while they are drawing so they can erase mistakes or start over. I find the dry towels are better for in the moment, but they can leave behind some residue. When they are completely done, we use a wet cloth to clean it all up. The kids get so excited about drawing on the windows that they are happy to help clean the windows before and after their activity. Total win-win for me! 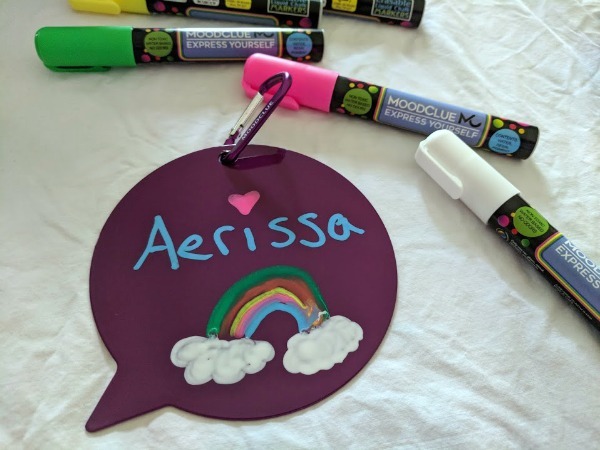 So if you are looking for a fun indoor activity for your kids, add MoodClue liquid chalk markers to your craft supplies. 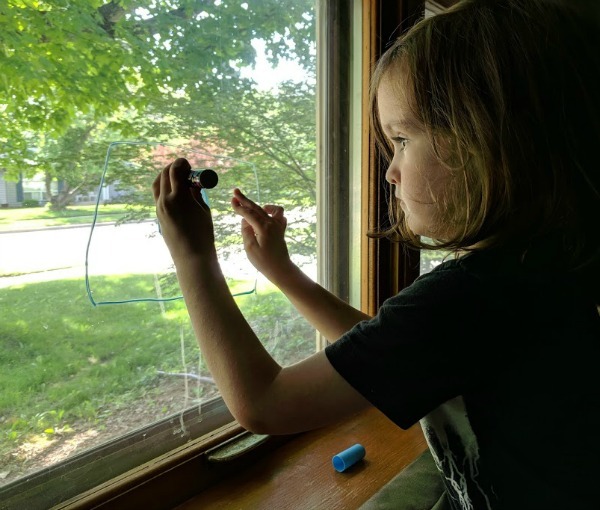 Having the kids draw on the window is a great activity to encourage creativity and have them practice writing. This is a great addition to your homeschool art and writing centers.